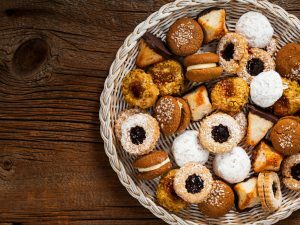 A no-bake recipe to prepare if you want surprise your guests. 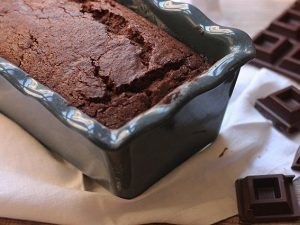 The right recipe for all chocolate lovers! Here's how to make it. 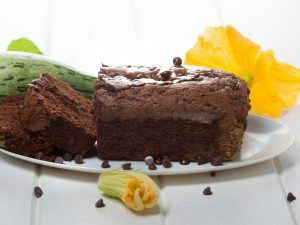 Ingredients: For the cake: 120 g (4.2 oz) dark chocolate; ¼ cup cream; 200 g (7 oz) cream cheese; 15 g (0.5 oz) sugar; 2 tbsp milk; 6 g (0.2 oz) gelatine; ½ lemon (juice); ½ cup cream; 15 g (0.5 oz) sugar. For the glaze: 30 g (2 oz) dark chocolate; 1 tsp water; 1 tsp gelatine; 10 g (0.3 oz) cocoa powder; 30 g (1 oz) sugar; 3 tbsp cream. 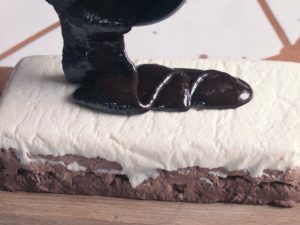 For the cake chop dark chocolate, pour cream over and heat in microwave until melted. Stir cream cheese and sugar together. Add powdered gelatin into warm milk and stir until dissolved completely. Pour gelatin solution into cream cheese mixture and stir to combine. Add lemon juice. Beat cream with 15 g of sugar until stiff peaks form. Fold the cream into cream cheese mixture. Spread 150 g (5 oz) over the bottom of small rectangular baking pan covered with parchment paper. Let set in fridge for 10 minutes. Add ½ of the melted chocolate into leftover cheese mixture. Spread 85 g (about 3 oz) of chocolate mixture over the first layer in the pan. Leave to set for 10 minutes. Add more chocolate into leftover cheese mixture and spread the final layer on top. Let set for 10 minutes. Meanwhile make simple glaze by covering gelatin with water. In a separate pan whisk sugar with cocoa, add cream, stir until smooth and heat over medium heat until smooth and no sugar crystals left. Add bloomed gelatin and stir until smooth. Remove the cake from the pan and cover with gelatin choco glaze. Optional: sprinkle some cocoa and almond flakes on top.